As with any major undertaking, it is always good to work from the general abstract idea and then narrow in on the specific details. The first task is always to develop the composition of the fence through a concept sketch. This mirrors the way that an artist begins a painting or drawing. If you do not start with a good composition, then all the craftsmanship in the world will not be able to help your work in the long run. This is a scrollable design composition for the snowplow and the surrounding wintery landscape. Feel free to scrool the image above to view its entirety. I began with several sheets of graph paper, secured together in a long scroll. The graph paper is ideal for the design process because each square equates to a foot of space on the actual fence, making it easy to convert from the design to the full scale project. I drew the winter section of the fence mural keeping the design and detail very general. This phase only served to flesh out a working graphical composition in terms of shape and form. At this point, I am not concerned with what signs will be used to construct the fence or any technical details. Within the composition I found the desired placement of the snowplow. The composition gave me a broad general shape, where the truck could be placed, and also a rough idea of the correct perspective for the truck. The small scale snow plow constrcuted to fit into the landscape with the correct perspective. The next step was to trace the hill and surrounding forms onto another separate sheet of paper. This way I could start drawing the truck in relation to the hill while retaining the original sketch. This saves a lot of design time because you only have to re-copy the shape of the hill for the truck instead of massive erasing on the design blueprint itself. 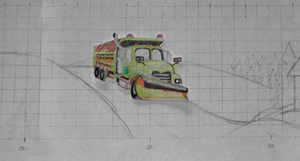 Once I was satisfied with the look of the truck in relation to the hill I began to transform this sketch into the first template for the actual snowplow.